eBuddy mobile messenger is chat client application for mobile phones, which connects you to all the major Instant Messaging networks. support MSN Messenger, Yahoo!, AIM, Google Talk, MySpace IM and ICQ simultaneously. With eBuddy Mobile Messenger you can be online with multiple accounts at the same time. Be online with multiple accounts from the same IM network (like multiple MSN accounts) or combine your accounts of different IM networks in one contact list. Create an eBuddy ID for easy sign in with multiple accounts. Have a comprehensive thesaurus handy any time any place. Using “Moby Thesaurus II” containing 30,260 words, with 2,520,264 synonyms and related terms. You can be certain that alternative words can always be found. This app tell us the time in the period we want… 1, 10, 15, 30, 60 minutes… Just keep the app open. 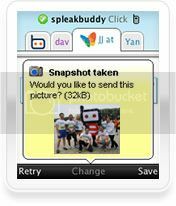 With the eBuddy Mobile Messenger you can share all the cool things you do in an easy way. You can set your personal message and take a brand new display picture, directly from your phone’s camera. i tried this new version 1.5.0 on my mobile Nokia N81 but it working very slowly not with the fast which the other versions worked with me please i want solve this problem how ? ?